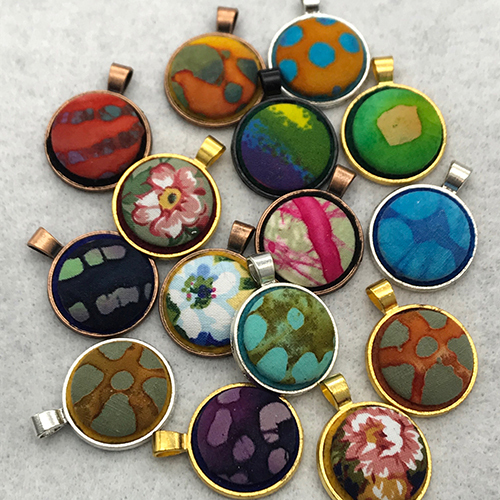 We design fabric-covered pendants and hand-made fabric cords which hold them. While we are online, we distribute almost exclusively to gift shops, especially hospital gift shops. We have two lines of necklaces that sell in gift shops. For $19.95, you’ll find kids and adult fabric-covered pendants on faux suede cords. The simple fabric-covered pendants for adults also come with faux suede cords. 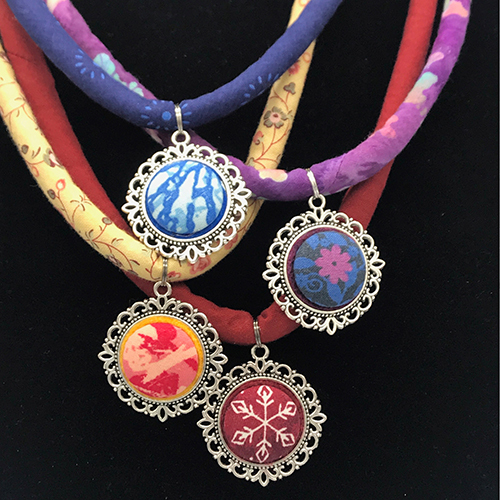 At approximately $45, our more upscale line of necklaces come with two handmade fabric cords (a print and a solid color), plus a fabric-covered pendent, providing two necklaces for the price of one. The pendants and cords are interchangeable and collectible. For more information, sign up for our monthly newsletter which is published in the first quarter of every month, or write Karen Little at Karen@Littleviews.com.